^ The Washington Double Star Catalog 頁面存檔備份，存於互聯網檔案館, Brian D. Mason, Gary L. Wycoff, and William I. Hartkopf, United States Naval Observatory. Accessed on line December 20, 2008. ^ Herter, T. Stellar Masses. Cornell University. （原始內容存檔於2006-07-18）. ^ Eclipsing Binary Simulation. Cornell Astronomy. （原始內容存檔於2008-06-23）. ^ Bock, D. Binary Neutron Star Collision. NCSA. （原始內容存檔於2007-06-26）. ^ Nguyen, Q. Roche model. San Diego State University. （原始內容存檔於2007-03-23）. 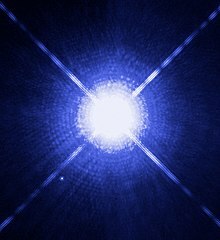 ^ Neutron Star X-ray binaries 互聯網檔案館的存檔，存檔日期2008-12-10., A Systematic Search of New X-ray Pulsators in ROSAT Fields, Gian Luca Israel, Ph. D. thesis, Trieste, October 1996. 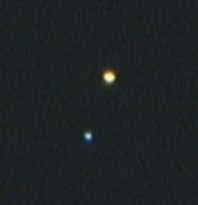 ^ Binary and Multiple Star Systems. Lawrence Hall of Science at the University of California. （原始內容存檔於2006-02-07）. ^ Entry 14396-6050, discoverer code RHD 1AB，The Washington Double Star Catalog 互聯網檔案館的存檔，存檔日期2007-08-03., United States Naval Observatory. Accessed on line August 20, 2008. ^ References and discoverer codes, The Washington Double Star Catalog 互聯網檔案館的存檔，存檔日期2008-04-13., United States Naval Observatory. Accessed on line August 20, 2008. ^ Boss, A.P. Formation of Binary Stars. (編) （eds.）J. Sahade, G.E. McCluskey, Yoji Kondo. The Realm of Interacting Binary Stars. Dordrecht: Kluwer Academic. 1992: 355. ISBN 0-7923-1675-4. ^ Boyle, C.B. Mass transfer and accretion in close binaries - A review. Vistas in Astronomy. 1984, 27: 149–169. Bibcode:1984VA.....27..149B. doi:10.1016/0083-6656 (84)90007-2 請檢查|doi=值 (幫助). ^ The First Black Hole. University of Toronto. （原始內容存檔於2008-03-07）. 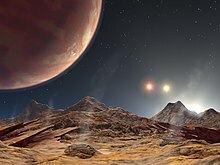 ^ Planetary Systems can form around Binary Stars. Carnegie Institute. 2006. （原始內容存檔於2011-05-15）.